Karlsruhe, home to about a quarter of a million people, is located in the southwest of Germany, in the German State of Baden-Württemberg. 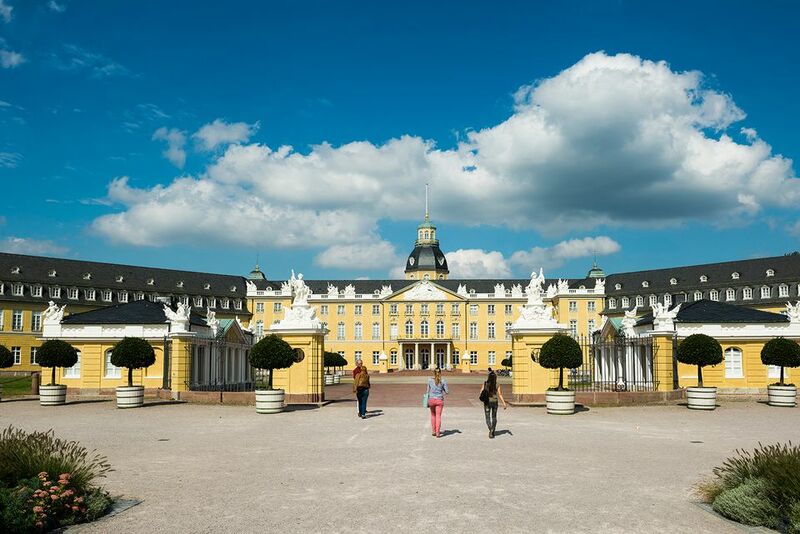 You'll find Karlsruhe north of spa town Baden-Baden, and south of Heidelberg, both interesting travel destinations. Karlsruhe is known as the center of Justice in Germany, owing to its two high German courts, and is known to tourists as "gateway to the Black Forest" which lies to the south, bordered by France and Switzerland. Why Do People Go to the Black Forest? The idea of the Black Forest, Schwarzwald in German, may be grander than the reality. Still, the Black Forest offers hiking trails, spa towns, and some interesting wine routes, including Baden and Alsace Wine Routes. Christmas markets and festivities are very prevalent in the Black Forest starting in the last week of November. For more on the Black Forest, see the official Black Forest site. Karlsruhe Rail Station or Hauptbahnhof is in the center of a large hub of transportation. Step out of the station and you'll be facing a hub for trams that can take you to the central city or quite far away. There are several hotels in the area. Inside the station, you'll find restaurants, bars, bakeries, and sandwich sellers. In fact, in 2008 Karlsruhe won the "Train Station of the Year" award for a "lively and relaxing service-oriented station." Frankfurt International Airport is about 72 miles from Karlsruhe. Trains from the main rail station go directly to Frankfurt Airport. The closest airport is Baden Karlsruhe Airport (FKB), 15 km from the city center. We had a pleasant stay at Hotel Residenz Karlsruhe, which has a bar, restaurant and is adjacent to the train station. Karlsruhe has a lively center built around the Marktplatz or main market square. Shoppers will be rewarded by many pedestrian streets lined with shops in the downtown area. Start with the Karlsruhe Palace (Schloss Karlsruhe), because Karlsruhe started here when the palace was constructed in 1715. Today you can tour a few rooms of the palace or the very extensive museum Badisches Landesmuseum (Baden State Museum) that takes up much of the palace today. If you're there on a rainy day, it's a way to escape the wet. There's a cafe inside, and entrance fees are reasonable. The palace sits at the hub of a "wheel" of roads that radiate from it, an oddity on a map and fine example of Baroque city planning. Like nearby Baden-Baden, Karlsruhe has several spa complexes. Terme Vierordtbad (pictured) has a bathing complex, saunas, and steam baths at a reasonable price. Just in front of the train station complex are the Stadtgarten and the site of the Karlsruhe zoo. It's a wonderful place to walk around, with exotic animals tucked away and sometimes seeming to be free within the garden. The Kleine Kirche (Little Church) is the oldest in Karlsruhe, dating to 1776. Technologically inclined artists would do well to visit ZKM (Zentrum für Kunst und Medientechnologie), Karlsruhe's Center for Art and Media Technology.